The Lessico etimologico italiano provides: 1. The first fundamental etymological dictionary that systematically takes into account written Italian and the Italian dialects. 2. 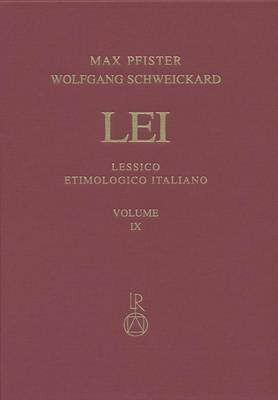 The first Italian etymological dictionary that corresponds to the FEW in its structure and presents the Italian vocabulary in the general context of Romance languages. Taking the etymon as a starting point, it is attempted to present the etymology of each word, taking into account sociocultural and geographical aspects. 3. Systematic, chronologically ordered citations for each spelling and each meaning; bibliographical notes at the end of each article, which are based on the current state of research. 4. Alphabetical glossary at the end of each volume, including an index of derivational morphemes.